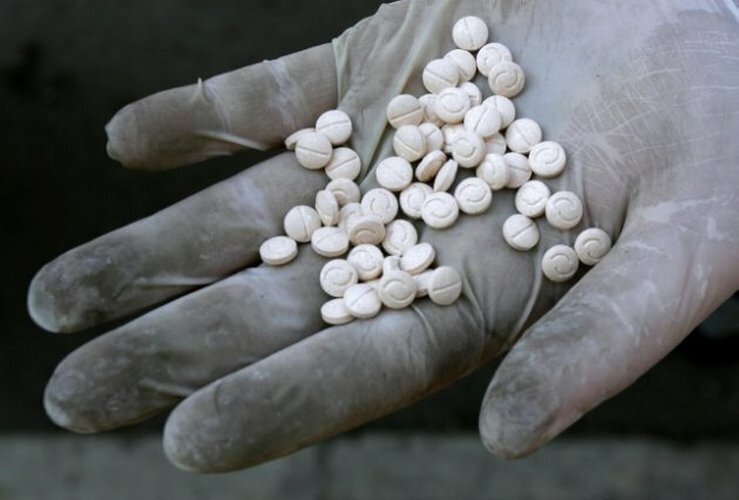 Four men were arrested as members of a ring believed to be manufacturing and trafficking large quantities of an illegal drug called Captagon, during an operation near Elefsina and Megara on Friday by Greece’s Financial Crimes Unit (SDOE), in cooperation with the Navy and police. Following a lengthy stake-out, SDOE located and raided a drugs lab near Elefsina, seizing 635,000 tablets of the drug, which is associated with ISIS fighters who are said to use it extensively. The market value of the tablets is estimated at 10 million euros. Authorities also seized weapons, cash and a car. The pills were stashed in specially made crypts inside a truck that was also seized. Two Greeks, one Albanian and one Turk were arrested but police said they are looking for at least three more ring members, including a retired policeman. In a separate raid in Megara, SDOE found a speed boat that had been retrofitted specifically to transfer the pills out of Greece. It is the first time authorities have discovered a Captagon lab in Greece, SDOE said. Captagon is a synthetic amphetamine which was first created in the sixties to treat hyperactivity, narcolepsy and depression but was banned in the mid-eighties for being highly addictive. The drug is believed to be flooding the Middle East. Data from 2010 showed one third of the worldwide Captagon production was consumed in the region. SDOE said it will hold a joint press conference with the police and Navy on Monday (March 6).